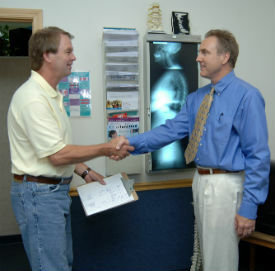 Dr. Bennett attended College of Lake County and Augustana College in Rock Island, IL before moving on to his father’s alma mater, Palmer College of Chiropractic in Davenport, Iowa. Dr. Bennett’s father had introduced him to Activator Methods® instrument adjusting when Dr. Bennett was a teen. The results were amazing! Dr. Bennett used the Activator Methods® of analysis in the student clinic at chiropractic college to determine where to adjust his patients. He knew that he would specialize in using Activator Methods® in his future practice. Advanced certification in Activator Methods® allows Dr. Bennett to treat a variety of conditions. Since 2003, he has been an associate clinical instructor in Activator Methods® seminars. These seminars are given around the entire world and Dr. Bennett teaches in the Midwest. Dr. Bennett’s main activity outside of the office is singing on the worship team and choir in his church. He is a member of the Illinois Chiropractic Society and Main Street, an organization that coordinates local business owners. Through this group, Dr. Bennett works on events and projects that bring people to our beautiful downtown area. Libertyville is even used as a national model for the Main Street organization! Dr. Bennett is a supporter of Feed my Starving Children, a national nonprofit group. Several times a year, Bennett Chiropractic Care holds events to support various people in need in our community. Our annual coat drive allows patients bringing in the donation of a coat to have free treatment. Once a year, we also hold an event to collect stuffed animals for the local fire department. If you bring in a stuffed animal on this day, you’ll have a treatment at no charge. Around Christmastime, Bennett Chiropractic Care adopts several local families in need of support. You can bring a donation or gift to the office and receive a free treatment in return. We understand that you need effective, safe health care options. Contact us today to discuss how we can help you!